Waardenburg syndrome (WS) is a rare disease characterised by sensorineural deafness in association with oculocutaneous pigmentary anomalies and dystopia canthorum. In this article, we report a 6-year-old boy with WS2, one of four clinical types of WS, for its rarity and relative paucity of reports in the otological literature. We also review the relevant literature of this rare disorder. We report here a case of WS2 from India, for its rarity and relative paucity of reports in the otological literature. 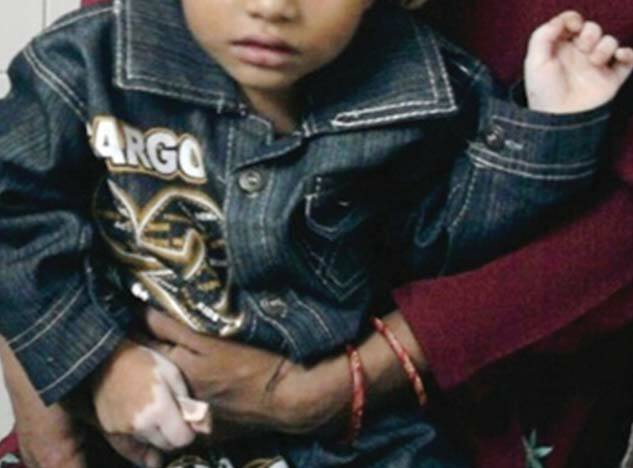 A 6-year-old boy presented at the outpatients department of ENT and HNS, with the chief complaints of hearing loss and inability to speak since birth. Physical examination of the patient revealed a centrally placed white forelock of hair; de-pigmented white patches on the body mainly over the hands, forearms, and abdomen; and bilateral blue iris [Figure 1] and [Figure 2]. There was no history of similar illness or findings suggesting WS in any of the other family members and siblings. There was no history of consanguinity in the family. On examination of the ear, nose, and throat no abnormality was detected. Audiological assessment utilising brainstem-evoked response audiometry (BERA) employing monaural clicks at 110 and 100 dB stimulation in both ears showed no identifiable BERA wave peaks at both sound intensities, suggesting severe bilateral sensorineural hearing loss. Ophthalmological examination showed complete iris hypo-pigmentation (pale blue eyes) bilaterally. There was no evidence of dystopia canthorum. Based on the clinical features the patient was diagnosed as having WS2 because of absence of dystopia canthorum. Diagnosis of WS is essentially clinical. Unfortunately, not every case expresses all clinical manifestations of complete WS and the incomplete form is commonly described. The WS consortium  proposed the diagnostic criteria for diagnosis of WS1 in 1992 [Table 1]. Two major or one major plus two minor criteria are necessary for diagnosis of WS1. Liu et al. have proposed that for diagnosing WS2 two major criteria be fulfilled and dystopia canthorum be replaced with premature greying as one of the major criteria. Hearing loss is the most serious feature in WS. It is congenital, sensorineural, and usually non-progressive. It may be unilateral or bilateral, and can vary in degree from slight to profound. Penetrance of sensorineural hearing loss has been observed to be 69% in WS1 and 87% in WS2 after excluding probands ascertained through their hearing loss. Hearing loss can be explained by a lack of melanocytes in the stria vascularis of the cochlea. 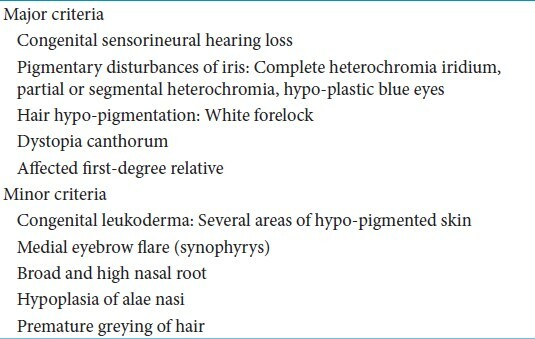 Three major (sensorineural hearing loss, characteristic blue eyes, and white forelock) and one minor (skin hypo-pigmentation (congenital leukoderma)) criteria were found in our patient. According to these criteria the child was diagnosed as having WS2. Neither parents nor any other member of the family had any history of pigmentary abnormalities, congenital deafness, or findings suggesting WS. Therefore, the observed patterns of anomalies in this patient are probably the result of a new mutation within the gene. All the features of WS1 and WS2 except sensorineural hearing loss are essentially benign and cosmetic in nature, and do not necessitate active intervention, but deafness, if severe, can be a major handicap. The phenotypic features of WS help to make an early diagnosis of this syndrome among deaf-mute children. An early diagnosis may aid in the initiation of early treatment by cochlear implantation leading to improvement of speech discrimination and spoken language. 1. Waardenburg PJ. A new syndrome combining developmental anomalies of the eyelids, eyebrows and nose root with pigmentary defects of the iris and head hair and with congenital deafness. Am J Hum Genet 1951;3:195-201. 2. Nayak CS, Isaacson G. Worldwide distribution of Waardenburg syndrome. Ann Otol Rhinol Laryngol 2003;112:817-20. 3. Soni CR, Kumar G. Child neurology: A patient with dissimilar eye color and deafness. Neurology 2010;74:25-6. 4. Qin W, Shu A, Qian X, Gao J, Xing Q, Zhang J, et al. A novel mutation of PAX3 in a chinese family with Waardenburg syndrome. Mol Vis 2006;12:1001-8. 5. Tomita Y, Suzuki T. Genetics of pigmentary disorders. Am J Med Genet C Semin Med Genet 2004;15:75-81. 6. Dourmishev AL, Dourmishev LA, Schwartz RA, Janniger CK. Waardenburg syndrome. Int J Dermatol 1999;38:656-63. 7. Read AP, Newton VE. Waardenburg syndrome. J Med Genet 1997;34:656-65. 8. 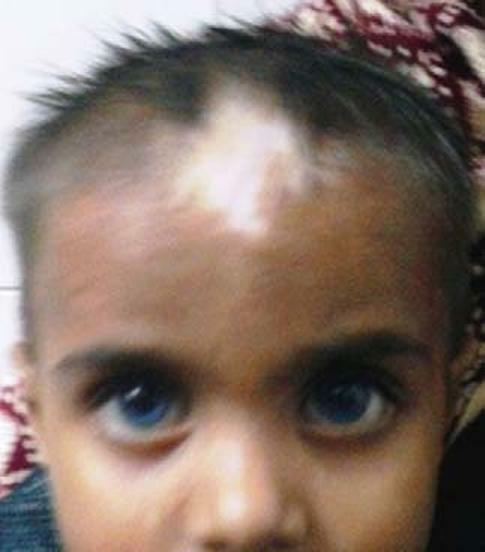 Krishtul A, Galadari I. Waardenburg syndrome: Case report. Int J Dermatol 2003;42:651-2. 9. Tagra S, Talwar AK, Walia RL, Sidhu P. Waardenburg syndrome. Indian J Dermatol Venereol Leprol 2006;72:326. 10. Bondurand N, Pingault V, Goerich DE, Lemort N, Sock E, Le Caignec C, et al. Interaction among SOX10, PAX3 and MITF, three genes altered in Waardenburg syndrome. Hum Mol Genet 2000;9:1907-17. 11. Farrer LA, Grundfast KM, Amos J, Arnos KS, Asher JH Jr, Beighton P, et al. Waardenburg syndrome (WS) type I is caused by defects at multiple loci, one of which is near ALPP on chromosome 2: First report of the WS consortium. Am J Hum Genet 1992;50:902-13. 12. Liu XZ, Newton VE, Read AP. Waardenburg syndrome type II: Phenotypic findings and diagnostic criteria. Am J Med Genet 1995;55:95-100. 13. Arias S, Mota M. Apparent non-penetrance for dystopia in Waardenburg syndrome type I, with some hints on the diagnosis of dystopia canthorum. J Genet Hum 1978;26:103-31. 14. Newton V. Hearing loss and Waardenburg's syndrome: Implications for genetic counselling. J Laryngol Otol 1990;104:97-103. 15. Reed WB, Stone VM, Boder E, Ziprkowski L. Pigmentary disorders in association with congenital deafness. Arch Dermatol 1967;95:176-86.